Hi everyone, I'm Lauren from The Endearing Home blog. When Kim invited me to be a part of her Favorite Room series I seriously couldn't believe it! I am so honored and beyond excited to be Kim's guest and to share my favorite room here today. 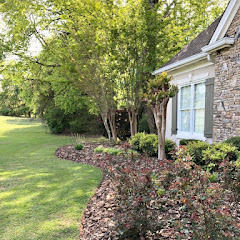 I became an instant fan of Kim's blog years ago and look forward to every Savvy Southern Style post in my in box, I love Kim's gorgeous home, all of her fabulous painted furniture transformations and decorating ideas! When I started to think about which room to choose my first thought was our dining room, but knowing Kim's love of buffalo check I just knew I had to go with our family room. The family room is one of the first rooms you see from the foyer. Our family room and kitchen are actually one big open space and are truly the heart of our home and where we spend the most time. Here is what the room looked like when we moved in over two years ago. As you can see from all of the paint samples on the wall I had a bit of hard time picking out a color. The winner was Ramie by Sherwin Williams. I loved the color so much I ended up using it in the foyer and throughout the hallways upstairs and down. Over the summer I decided I wanted to make the room flow a little better between the family room and kitchen by removing the red rug and accents. I am so happy with the new sisal rug, it's not as comfy as the wool rug, but we love the way it looks. With all the trees surrounding our back yard this room can feel dark and the new rug helped to brighten things up. The most important things to me when it comes to decorating our home are making each room feel comfortable, inviting and to reflect our family. We love the ocean, so this was the perfect place to display our seashell collections from beach vacations. 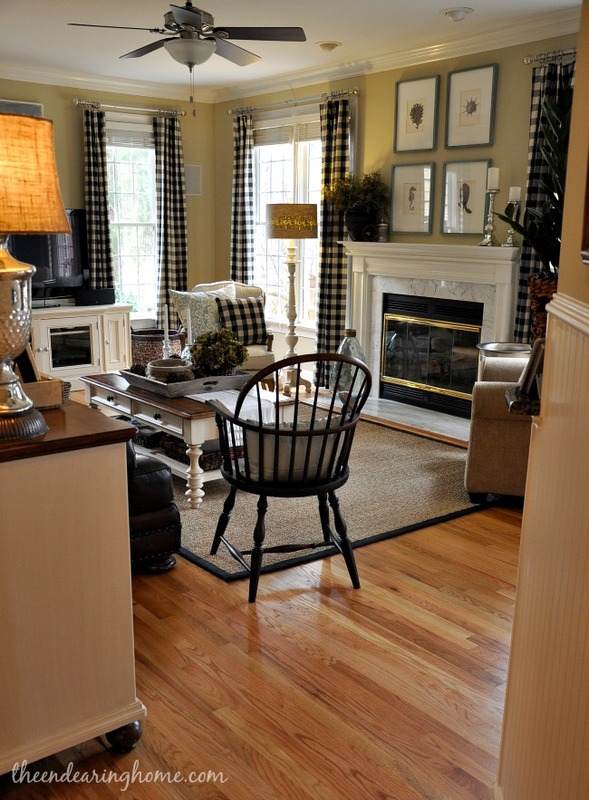 We are really enjoying the coastal cottage feel of the family room. For me, the thing that makes this room feel so warm and cozy are the buffalo check curtains. When deciding on curtains for the room I knew I wanted either toile, check or ticking. I have to admit I was pretty nervous when I first ordered these panels, wondering if they were maybe a little too bold and how my family would react. Once I put them up I instantly fell in love and my family approved too. I usually play it safe when it comes to big purchases, but it felt good to just go for it! 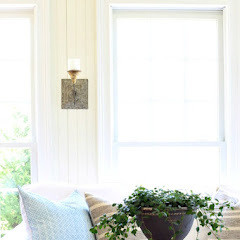 Stepping out of my decorating comfort zone and seeing what a big impact these curtains had on the room helped me get more creative with my choices when decorating the rest of the house. I would love to eventually add some decorative wood trim above the fireplace and finally get around to painting or replacing the brass on the fireplace doors. For now I am happy with the framed prints. They were hanging in our living room, but they found a new home in our family room. I love moving things around the house! One of my favorite home improvement projects was the addition of the beadboard paneling along the wall between the two rooms. It also extends down the hallway and throughout the foyer. 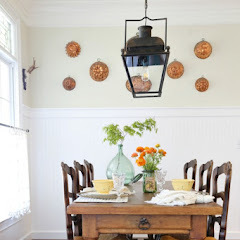 I could seriously add beadboard to every room, I just love the look of it! Years ago I fell in love with a swatch of apple green velvet that I ordered from Ballard Designs. I knew I had to find a place for it in our home someday. When I was looking to add another touch of green to the room I thought a soft velvet pillow in that pretty apple green would be the perfect addition. We have a formal living and dining room, but when hosting family and friends we always end up gathering in the family room. I am not much of furniture painter, it usually takes me several attempts to get it right. That was definitely the case with this cabinet I found on Craigslist. We needed some extra storage and despite my lack of painting skills I am really happy with how the cabinet turned out. The knobs from Hobby Lobby really helped it look complete. I also painted the TV console and the chest next to sofa. The windsor style chair was another Craigslist find for $30. Most evenings after dinner this is where my husband and I enjoy catching up on the days news and a glass of wine together. This is the room where I don't stress about crumbs or spills (thanks to the leather sofa) and there are no rules about feet on the coffee table. Only a few pillows actually stay in place, the rest usually end up on the floor. Here's another view into the kitchen. I do quite of bit of crafting from the kitchen table, so it's nice to be able to watch TV and see what all of the Real Housewives are up to. Thank you so much Kim for having me as your guest here today and for letting me share my Favorite Room with your readers! This was so much fun and hope you will stop by to say hello! Thanks, Lauren for opening your home and sharing your favorite room. Yes, I love those checks. Okay y'all please go over to The Endearing Home and say hi to Lauren and tour some more of her beautiful home. Miss any past favorite rooms? Find them all here. Lauren's home is as beautiful as she is!…Her style is impeccable and her love of family shows through this warm and cozy room that she has created for them..Just love her color scheme and every gorgeous detail in the room…yes, everyone should hop over and see the rest of her home as it is fantastic!! Thanks Kim for another terrific favorite room feature!! Have a great weekend! 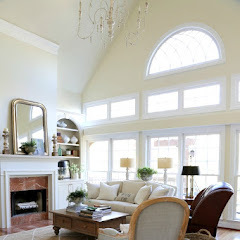 I very rarely see a family room that blows me away, but Laurens room does~! I love every detail and am going over to join her blog right now cause I dont want to miss a single thing she does.. Thanks for sharing Lauren's room with us it is so warm and cozy. Love much of her furniture especially her chairs and he Buffalo check curtain are so pretty. Thanks for the tour! I stumbled upon Lauren's blog some months ago, and was instantly smitten! I find myself going back to peek at her family room and kitchen a lot! Thanks Lauren for allowing me once again to walk through and Kim for another fabulous feature! Thanks for introducing me to Lauren's home and her blog! She says she isn't much of a furniture painter, but she may need to rethink that! Love, love, love those buffalo check curtains and I'm headed over to see more! "Real Housewives," Lauren is my kind o' girl! I love her home and this is my favorite space, too! The buffalo check curtains are fabulous and I know you love them, too, Kim! Thanks for sharing! You have a beautiful home!!! It looks so cozy!! Lauren, I could move right in! This is really my heartbeat style. LOVE the black and white softened with browns and tans. I'm drooling all over my computer screen! I'm heading over the The Endearing Home to get the URL for my blog roll! Don't want to miss another post.! Kim, great, fabulous home and post. I feel like this is the closest post to my real style. Just love this! As I looked around Lauren's room I kept thinking of you, Yvonne! It looks alot like your home and style!!!! Both beautiful! Wow, I love Lauren's family room/kitchen. What a difference the sisal rug made - totally grounded the space. Thanks for sharing Lauren with us today Kim! Lauren, I am so glad that you shared your favorite room here. Everyone loves it like I knew they would. I hope you have a wonderful weekend! 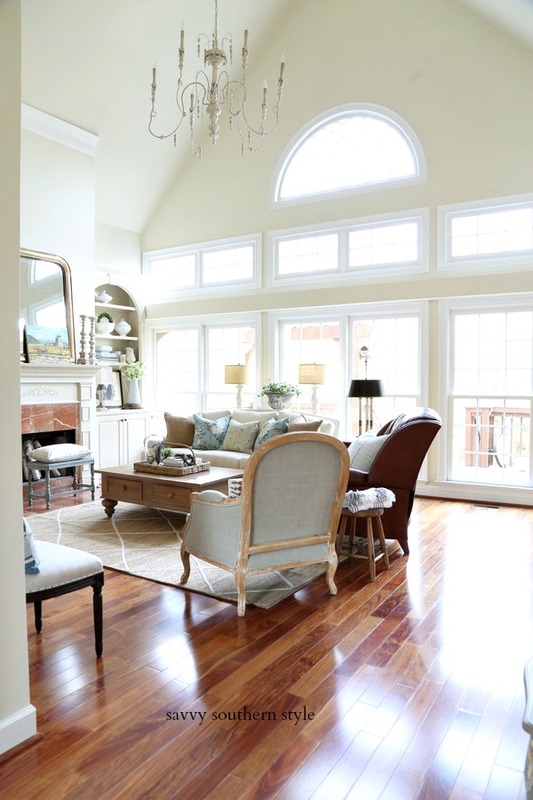 What a beautiful, cozy, welcoming room! I need to go visit her blog :) thanks for sharing! A very pretty AND practical room, with great attention to detail and beautiful aesthetics. Thanks for introducing Lauren to us, Kim! Happy weekend to both of you! One of the most inviting family rooms I have seen! I LOVE the checks and the black and white and was excited to see that you were featuring her! I love the room and the checkered curtains. Thanks for introduicing me to Lauren's blog. 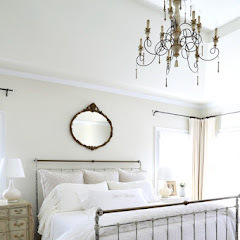 I have been in love with lauren's home and style since I found her blog last year....her style is so tasteful yet do-able...there's nothing about lauren's home I don't love! Lauren's family room definitely looks like a warm and cozy room in which to gather. She's done such a nice job in creating such a welcoming spot to hang out. I love Laurens room! I am running right over to check out the rest of her blog. 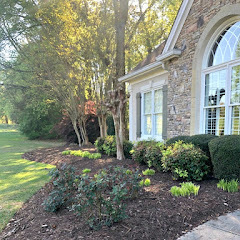 Thanks for sharing her home with us Kim! LOVE LOVE her style...can't wait to go over and see more!! Beautiful home! Beautiful home! Thanks for sharing. What a gorgeous room! It is filled with beautiful and interesting treasures. Great choice Kim! Lauren's room is just gorgeous. Love this beautiful and inviting cozy room. I love this room!!!! Your home looks amazing. What a beautiful room! I love the accessories and buffalo checked curtains. Kim, what a captivating series! First time here for this, what an awesome series. Lauren's room is impressive and oh, so striking! I am crazy about the checks and in black and white, beautiful! What a beautiful room. SO cozy and beautifully done. Thanks for the intro, Kim. I am headed over there right now!!! LOVE this series!!!! Lauren your home is beautiful. Your painting is very good - everything you have painted in your family room looks great. I am glad Kim introduced us to you. Can't wait to follow your blog. Absolutely gorgeous Kim! What a treat to see Laurens beautiful home.Love her fireplace mantle too! I always love getting a chance to see more of Lauren's gorgeous home!! Those black/white check curtains are so fabulous and it is such a warm and welcoming space. Lovely, what a difference removing that old rug made, wow! Lauren's room is lovely and the colours and textures are both interesting and calming. Thanks for sharing, Kim. What a warm charming room. I love buffalo check and all you have done with your paint, accessories are just so well done. I can see this is where you all enjoy being most of the time. Where did you get the pretty green pillows? I want to add that color to my house! Where did you find the char Miss Bailey is sitting on. Love the upolstrey. I also have the same coffee table!! I guess you are talking about the photo on my sidebar? That is many years old from a local furniture store. I want the coffee table... where did you get it? LOVE! This was a guest post and you would need to ask over at The Endearing Home blog.